How to recover deleted images / photos from memory card free? In this instruction you can find a step-by-step solution to recover deleted or lost images and photos from memory card using free data recovery software. Deleted images are recoverable as long as they are not overwritten. Free download this image recovery software and follow this guide to undelete files now! Photos and images play an important part in daily life, as they record past moments which can be childhood, vocations, ceremonies and so on. These moments cannot be recreated, but they can be recorded in photos for good. However, life is not that easy, as you may lose previous photos due to various factors, for example, accidentally press Delete button, virus attack, unintentionally formatting SD card, etc. It’s difficult to accept the fact that important images get deleted. Nowadays digital image can be stored on all kinds of storage devices, such as USB flash drive, memory card, hard drive, PC, external hard disk, etc. However, none of these storage devices can escape data loss issue. It seems to be a real pain if photos are deleted from memory card and you do not have any backups. Fortunately, in most cases, deleted images are recoverable. There is no need to worry about this issue, as you can follow this guide to easily recover deleted images and photos from memory cards and other storage devices. Can deleted images be recovered from SD card? The answer should be YES, but the premise is that deleted images are not overwritten. We’ve explained this issue a lot that images deleted from memory card or other storage devices won’t be erased immediately. The reason why we cannot see deleted files is that the only pointer of the file gets deleted, leaving file content on memory card. The disk space is tagged as free by system, waiting for storing new data. Once new data is stored on such free space, deleted files will be overwritten. 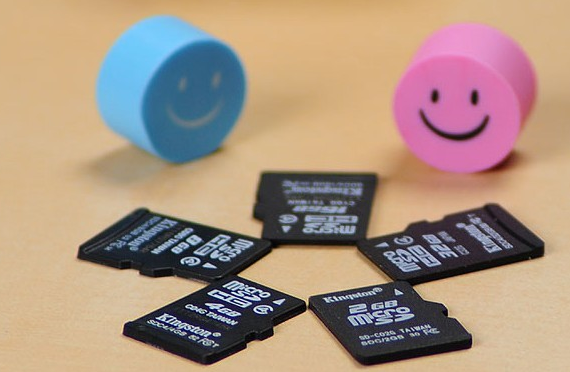 Therefore, you have good chance to undelete photos from memory card, phone or digital camera before they get overwritten. To ensure best recovery result, you should know one thing. Soon after you realize that images have been deleted, you should stop using the memory card. Do not take photos or store new data on it. Then download and install free image recovery software on your computer to scan the memory card for lost or deleted photos. 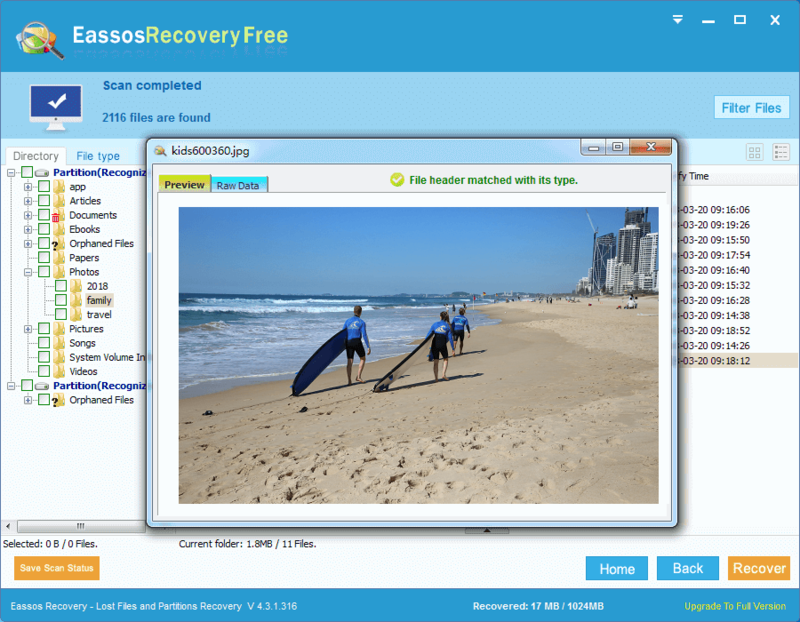 Eassos Recovery Free is free photo recovery software for memory card, which has the most intuitive user interface. It can efficiently recover deleted files from SD card, flash drive, hard disk, external hard drive, pen stick and more. It supports almost all types of memory card including SD card, compact flash card, XD card, SDHC, Micro SD, mini SD, etc. Apart from recovering deleted images, this free recovery software also supports recovery of more than 550 types of files including photos, videos, audio, documents, apps, emails, archives, etc. It performs read-only actions when recovering lost files from any storage device, which does not affect original data or causing any damage. The scanning result provides two options to view recoverable files, helping users to locate what they need quickly. How to recover deleted pictures/images using free data recovery software? Step 1: Connect the memory card to computer. When you attempt to recover deleted images or photos from memory card, you should connect the memory card to computer where free data recovery software is installed. The memory card can be connected via card reader to USB port. Then you can see the memory card in Windows Explorer. 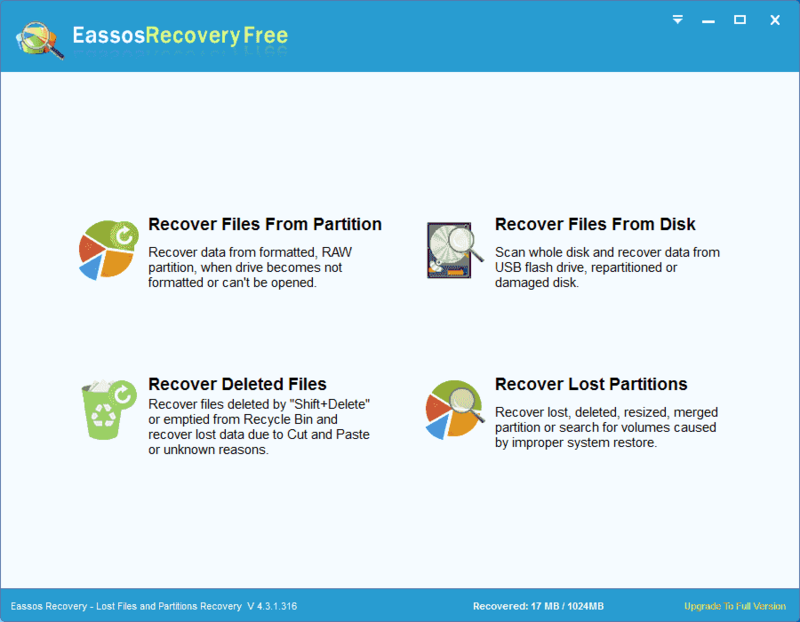 Step 2: Launch free image recovery software – Eassos Recovery Free, and select proper recovery option based on data loss cause. 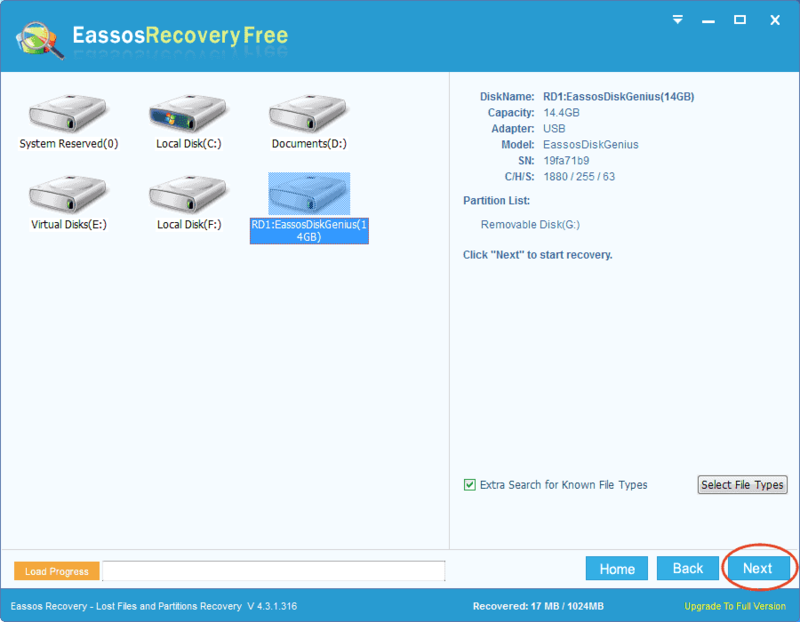 You can see four recovery options on the main interface, and each is able to deal with a series of data loss issues. Each recovery mode deploys different algorithms to search for lost data, thus you should choose the one that fits your situation best. In this example, we are going to recover deleted images, the “Recover Deleted Files” should be chosen. Step 3: Select the memory card and click “Next” button to start scanning. You can see all partitions in this interface, including those on local disk and external drives. Once a partition is highlighted, you can view its parameters on the right pane, so that you can easily identify whether it is the drive you want to recover data. Step 4: When scanning completes, you can preview recoverable files. The follow picture shows a jpg file is being previewed. Step 5: Recover images. Choose all images you want to restore and click Recover button, and you can select a location from computer to save these recovered files. As has been discussed above, there is a very easy way to recover deleted images, photos and pictures from memory card or other storage media. The recovery process is so simple that all beginning users can do it on their own. In case you face any problem, you can always ask in the comments or contact our support team. 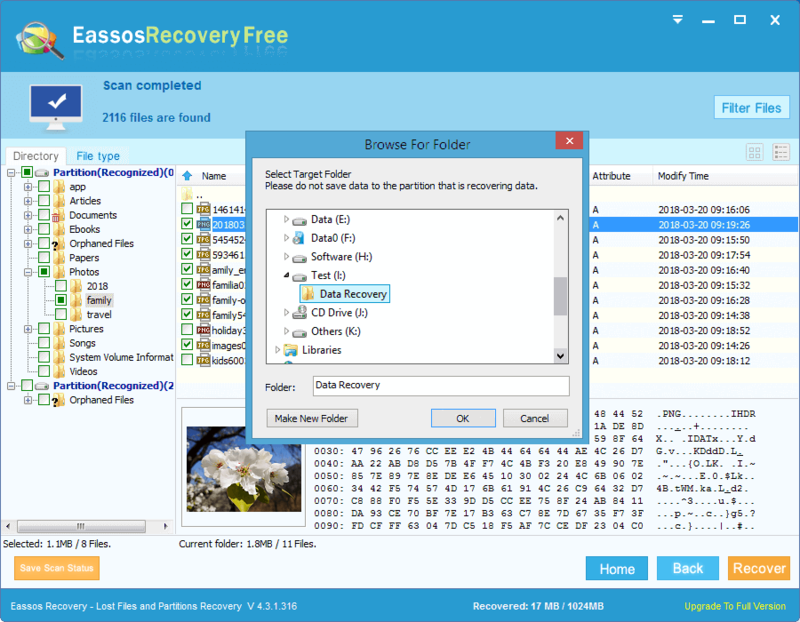 This entry was posted in Data Recovery and tagged Digital image recovery, image recovery from SD card, recover deleted images, recover deleted pictures by EASSOS. Bookmark the permalink.